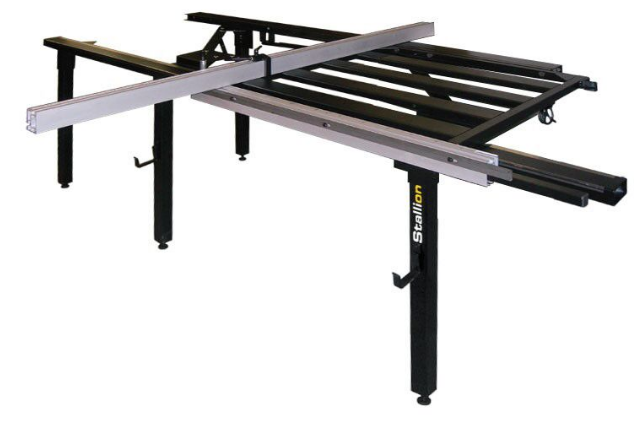 The CWI Stallion 60″ sliding table attachment is a great addition to your tablesaw for crosscut and miter work. It can be very difficult for woodworkers to handle large sheet goods while cutting on their tablesaw. The CWI-SLT60P sliding table creates a simple and effective method to accomplish this task. With the crosscut fence mounted in the rear position the slider allows the user to cut up to 60″ wide panels with ease. With the crosscut fence mounted in the rear position the operator canstill crosscut up to 36″ panels. Miter work on solid wood parts as well as large wood sheets now becomes extremely accurate with the sliding angle capability of the crosscut fence. The CWI-SLT60P is truly a terrific addition to any standard 10″ to 14″ cabinet saw. The table rides on 14 sealed, steel ball bearing rollers and is supported by architectural grade heavy-duty steel tubing. Easy to adjust, extruded aluminum miter fence for accurate miters from 0° to 45°. Adaptable to virtually all 10-14″ table saws. Cut up to 60″* with the crosscut fence positioned at the rear. Crosscut or miter up to 49″* with the fence at the front of the table. Quick connect mounting bracket allows for easy removal of the sliding table from the saw for users with space/storage limitations.